← Southern Utah Workshop Coming SOON! 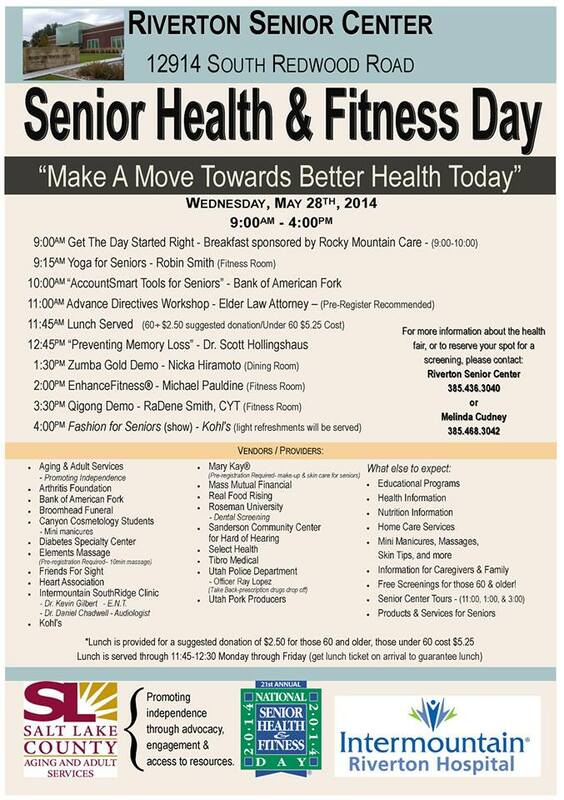 Do you have plans for Senior Health and Fitness Day? If you are not hosting an event I know of two places that are: 1) The Riverton Senior Center is hosting a Health and Fitness Day on Wednesday, May 28th. Please view the promotional poster for all the event details. Contact the Riverton Center 385.436.3040 for more information. 2) Clearfield Aquatic Center is hosting events too. Check this places out and see if you clients can attend some of the fun and educational events. If you know of any others places hosting this even please post we would love to hear about them.